Update 2: I finally figured out how to turn comments off. I think 308 is enough. Thanks to all the commenters for participating. Everything has been said multiple times by now. If you don’t like something, just keep reading and you’ll find someone who agrees with you. The comments at Dawn Eden’s place were pretty much the same arguments refuted here. Ironically, she titled her piece Attention, Catholic apologists: Share Mary with a skeptical Evangelical, thus tipping her hand that it is just as much about sharing Mary as it is sharing Jesus for them. While I might talk about Paul, Peter or others in the Bible, it would never occur to me to say I was going to “share” them with someone. It should all be about Jesus when it comes to that. For the record, I am not skeptical at all. I am highly confident that Jesus is the way, the truth and the life. I am equally confident that his mother, while a sinner in need of a Savior, was a great woman of God whose life teaches many important lessons. But under no circumstances should we pray to her or bow down to an idol of her, and under no circumstances are you required to have a relationship with her to get to Jesus. A common false dichotomy was that you are either on the Catholic bandwagon for Mary or you are dishonoring her. There is at least one other option: A proper understanding of her role. This came up over and over. And as noted elsewhere, if we can’t read the Bible and understand it without the Catholic church interpretation, what guarantees that we’ll be able to understand the Catholic church interpretation? Of course it is helpful to have experts and study guides, but the Bible doesn’t require that. Lots of non sequitors about how Jesus loved his mother, so [fill in the blank]. Yes, Jesus loved his mother, but that doesn’t mean we should pray to her or bow to her idol. The immaculate conception argument about Mary goes in circles. They want to claim that she had to be without sin so Jesus could be born un-tainted. But then it stands to reason that Mary’s parents must have been born without sin as well, and their parents, and their parents . . . otherwise Mary would have been tainted. Then they backtrack to say that something special was done at Mary’s birth. But, uh, why couldn’t that have been done at Jesus’ birth as well? Back to the beginning. Read the New Testament and look for mentions of Mary. The Book of Acts: one passing mention noting that she was n the room. That’s it. Romans? Zero. 1 Corinthians? Zero. 2 Corinthians? Zero. Hebrews? Zero. And on and on. I am not dismissing her importance, but the facts are clear: She was not a part of the Gospel message. There are no references to her leading people to Jesus, answering prayers, etc. The apparitions of Mary typically have unbiblical or anti-biblical messages. Therefore, they are not from God. Despite claims to the contrary, there is much evidence of people praying to Mary and other saints and bowing to idols of her. I’ve seen it myself and many on this thread conceded that they pray to saints. Not just talk to the saints, but pray to them. Here are pictures and just a sample of documentation. The deceased are deceased, unlike friends here who are alive. The Bible says not to contact the deceased. The Bible does give examples of asking the non-deceased to pray. The Bible does not even hint that the dead have omniscience or anything close to it. A common claim was that if the Catholic church got the Bible right, then all tradition is infallible. Anyone see how that doesn’t follow? Paul got his letters just right, but not everything he did was inspired. They don’t demonstrate how the organization that administered the Canonization process is synonymous with the Roman Catholic Church. They ignore the laundry list of errors the church has committed. Again, I’m not saying the Protestants get everything right. But they aren’t claiming infallible traditions, either. We agree on the infallibility of the Bible, which is a great starting point. No one ever demonstrated from our common source how the Catholic church’s tradition is infallible as well. I’ve heard of people praying to Saint so-and-so when they lose their keys. Then they find the keys and treat that as validation. But remember that Satan knows where your keys are. If you pray to the dead in clear violation of Scripture then God is under no obligation to answer you or protect you. The “infallible tradition” position and the notion that we have to have the Roman Catholic Church interpret the Bible for us fail in other ways. First, consider that the Bible teaches how to handle disputed matters. Now if the church was infallible and couldn’t get the interpretation wrong, why would the Bible mention such a thing? Second, how do you know if you properly understood the message of the church? If you can’t be trusted to understand the infallible Bible then why can you be trusted to understand the church’s allegedly infallible interpretation of it? Think carefully about that. It is bulletproof. When addressing the false teachings about praying to saints, I typically start by pointing out that the burden of proof is on the Catholics to demonstrate from scripture that the saints can hear the prayers of over 6 billion people 24 x 7 x 365 in any language. I read countless “just so” stories and hypothetical situations, but none with scriptural evidence and many that were in direct violation of scripture. We should only pray to God. Simple stuff. I encourage newcomers to search for “Marie,” “Glenn” or “Wintery Knight” and read their comments. Great points. Update: A special welcome to visitors from Dawn’s blog! Feel free to comment or look around. We will probably not agree on the topic of Marian devotion, but you might enjoy some of the pro-life, pro-family and other pieces. I have great respect for Dawn Eden’s pro-life endeavors and her promotion of abstinence in her book, The Thrill of the Chaste: Finding Fulfillment While Keeping Your Clothes On. She makes winsome and compelling cases on some important issues. But a sad side of her life transformation is that she has wholly embraced Catholicism and its false teachings. Please note that I know many Catholics who hold authentic Christian beliefs about the essentials. 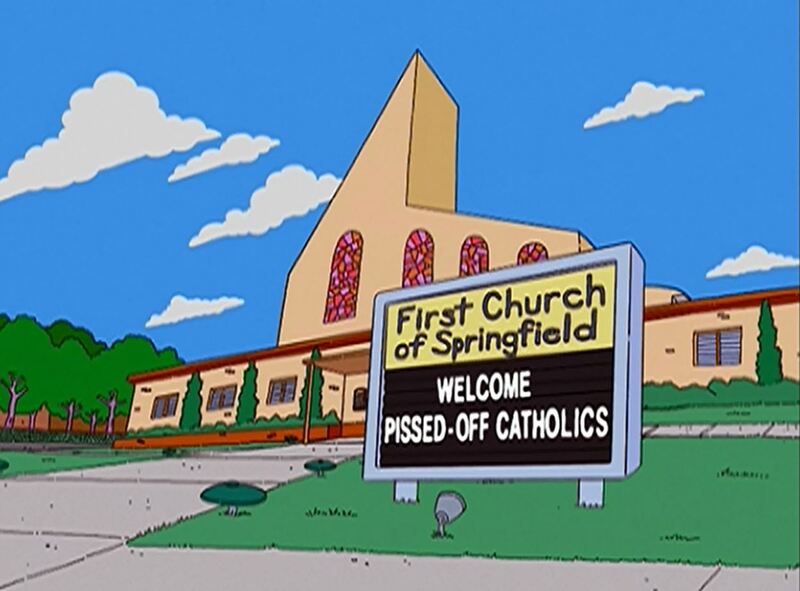 They are “bad Catholics” in the sense that they don’t buy the un-Biblical dogma from the bowels of the Roman Catholic Church such as Mary-worship, praying to the saints, purgatory, salvation by works, Papal infallibility, etc. Their local parishes actually teach fairly sound doctrine. I think there are many saved people in Catholic churches just as there are many unsaved people in Protestant churches. It all comes down to having true faith in Christ. Dawn recently had a link highlighting a video about a man struggling spiritually. He was crying out for help. Guess who saved him. Jesus? No, it was Mary. The “highlight” of the video was a vision of Mary that shifted to a statue of Mary. Just your basic idol worship. I’ve read the Bible a bunch. I see remarkably few passages about Mary and none that even hint at the role the Catholic church ascribes to her. Granted, Protestants sometimes overreact the other direction and ignore her, but they are far closer to the truth than Catholics. I submit that if a vision of Mary comes to you then it isn’t the real Mary. It is Satan, who is leading you away from the truth. I do encourage commenters to focus on the post itself and not just attempt to re-create the Reformation (as great as the first one was!). The video in question wasn’t just about having admiration for Mary. The protagonist specifically cries out for God and Mary appears. That’s really, really bad theology.